The Old City of Zamosc is a planned town from the Renaissance with blended Central European and Italian architecture. The city was built from 1582-1591 by the Paduan architect Bernando Morando, on the instructions of chancellor Jan Zamoysky. He named it after himself. The new town was populated by merchants from all nationalities, religious tolerance was shown to attract people and an academy was founded. The town also had an imposing fortress, of which now only little survives. It was built between 1579 and 1618, also by Zamoysky and Morando. This incredible city of Renaissance layout, designed by an architect from Padua in the late sixteenth century, is a destination not to be missed. It's a little shifted from traditional tourist routes, but it is worth making a detour. Simply gorgeous and unmissable. The centre of the town of Zamosc seemed like a minature of the Stare Miasto in Warsaw. But the features of this WHS that made it different were the extensive city walls and fortifications, and the Rotunda. Built as part of the town's defences, thye Rotunda bacame infamous during WWII as a transit camp and execution site. The communists continued that tradition during their years of oppression. Now it is at the centre of a cemetery, as a memorial to the victims. Each of the cells contains relics of a different atrocity. The town was founded by Jan Zamoyski in the late 16th century and has been described as the Padua of the North, The Town of Arcades or the Pearl of the Renaissance. Personally I could not agree less. The main rectangular square is dominated by the pink town hall and flanked by three-level burgher's houses, where the Armenian merchant houses take the beauty price. Zamosc is one of those towns were you just aimlessly wonder round, hour after hour enjoying the place and that you are here right now. After having visited Zamosc you hereby have my strongest recommendations for a south-eastern Polish detour! 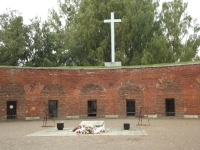 Places of Execution: The Rotunda (10 minute south of old city but included in the inscription together with the road to it) was used by the Nazis for executions during WWII. Now the "Martyrdom Museum"
97 Community Members have visited.